Mill-Max has developed a series of ultra-low and low profile spring pins for applications where above board height is limited. As packaging requirements for electronics continue to shrink in size, traditional interconnects don't always fit the bill. For board-to-board or device-to-board connections, low profile spring pins are a practical solution. Mill-Max has five new low profile spring pins to choose from that provide unique above PCB height profiles and through-hole or SMT options. The 0921-X & 0926-X series are through-hole mount and have either .0195" (0,5 mm) or .0275" (0,7 mm) mid-stroke travel. The 0965 is for surface mount applications and has .012" (0,3 mm) mid stroke travel. The pins are supplied in bulk as standard packaging. For applications requiring a single or double row strip or custom layout of pins other packaging options are available. The 0965 pins are available in standard single and douple row strips. 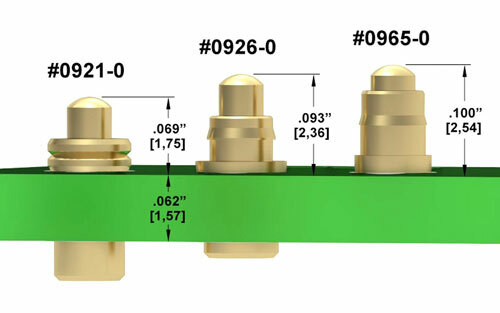 Alternatively the 0926-X pins can be mounted into machined FR-4 epoxy insulators, while the 0921-X pins can be supplied on removable Kapton tape.